We’d love your help. Let us know what’s wrong with this preview of Urdaisunia by Kyra Halland. To ask other readers questions about Urdaisunia, please sign up. Kyra Halland's Urdaisunia takes on a big task - combining an epic fantasy tale with a very personal and heartfelt story - and it succeeds completely. Urdaisunia tells the story of the battle for the throne of a land called Urdaisunia, the land between two rivers. Three generations ago, it was ruled by the Urdai, a strong and wise people. But, depending on who's telling the story, they either grew decadent and weak, or simply turned away from their gods and were turned away by their gods in return Kyra Halland's Urdaisunia takes on a big task - combining an epic fantasy tale with a very personal and heartfelt story - and it succeeds completely. Urdaisunia tells the story of the battle for the throne of a land called Urdaisunia, the land between two rivers. Three generations ago, it was ruled by the Urdai, a strong and wise people. But, depending on who's telling the story, they either grew decadent and weak, or simply turned away from their gods and were turned away by their gods in return. Either way, they were conquered by a nomadic, "barbarian" people, the Sazar, who have ruled ever since, and severely oppressed the Urdai as well. The story begins with a chance encounter. 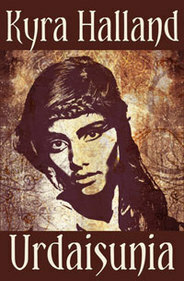 Rashali, a recently widowed Urdai peasant woman, literally crosses the path of Prince Eruz, the heir to the Sazar throne. But rather than grovel at his feet, she defiantly stands up to him, intriguing him. He must know where this poor, weak, oppressed woman finds the strength to look her oppressor in the eye. That sets in motion a relationship that leads Rashali to the Prince's chambers in the royal palace, then to the dungeons, and then on the run, fleeing for her life. And it sets Eruz on a new path himself, one that he never could have expected. And then there are the gods, who are quite real, and quite interested in the affairs of individual mortals. There are so many things to like about the book. First is the setting, which isn't the traditional medeival European-style fantasy-world. It feels more like the kingdoms of the ancient Middle East (Sumeria, Babylon and the like), which is a refreshing change. There's magic, but it's small and subtle, rather than flashy and world-changing, which is another change from the usual fantasy tropes. What's the most refreshing, though, is that the characters are well-rounded and three-dimensional. They're believable, as Rashali and Eruz struggle to overcome the prejudices and hatreds they have towards the other's people. The story alternates between Rashali's and Eruz's perspective, with occasional interludes showing what the gods - who are as interested in Rashali and Eruz as everyone else - are up to. Kyra Halland is one of those rare authors capable of creating a deeply realistic fantasy world, with an equally realistic romance embedded within it. Too many fantasy authors tack the romance on as an afterthought, or else the romance is all-important and the fantasy elements are hurled randomly into the mix, as if it doesn’t matter whether the obstacles keeping our pair of lovers apart are meaningful or not. Here everything is carefully thought out. Rashali is a simple village woman, struggling Kyra Halland is one of those rare authors capable of creating a deeply realistic fantasy world, with an equally realistic romance embedded within it. Too many fantasy authors tack the romance on as an afterthought, or else the romance is all-important and the fantasy elements are hurled randomly into the mix, as if it doesn’t matter whether the obstacles keeping our pair of lovers apart are meaningful or not. Here everything is carefully thought out. Rashali is a simple village woman, struggling to survive in an Urdaisunia now conquered by neighbouring Sazars. Eruz is a Sazar prince, treading a careful path between his father the king, his vicious, squabbling brothers and his own conscience. When chance throws Rashali into his path, he is forced to face up to the consequences of his father’s rule. And then, delightfully, the gods take an interest in matters and start poking around in the affairs of men for their own not particularly altruistic reasons. I’m not usually a big fan of having gods as active participants in a story, but here it works really well. It took me a while to overcome my resistance to miraculous events that just happen to carry the plot in the right direction. Here, of course, that’s the whole point, the gods are interfering and causing all sorts of things, good and bad, to afflict our heroine. Once I stopped worrying about the realism (or otherwise) of it, however, the story swept me up and carried me along beautifully, and I really enjoyed that aspect of the story. The gods are not at all as you’d expect, and their little squabbles and rivalries are great fun. There is a little (non-god-related) magic in this world, and one rather clever communication contrivance that weaves into the plot very well. The world itself is a simple one, with just a few neighbouring societies: apart from the Urdai and Sazar, there are the Sangh, the Kai-Kalle and the Xaxan. Urdaisunia, the focus of conflict between these various countries, has two major rivers but (because of a quarrel in the god-world) they are on the brink of drying up, leading to major tensions. The political differences, particularly between the Urdai and the Sazars, form the backdrop to the whole story. If I have a grumble, it’s that the characters tend to fall neatly into the good or bad side of the equation. The king, Eruz’s father, in particular, was a little too stupid for my taste. Even when Eruz brought evidence of his brothers’ treachery, the king made no effort to investigate, simply believing the brothers. His dislike of Eruz, who was an excellent army commander, seemed somewhat irrational. Kings really have to be better judges of character than that, if they’re to survive long in power. They also have to be pragmatic, and not allow their personal feelings to interfere with political decisions, although I suppose having a son and heir who constantly says, “Yes, but…” might get rather trying. My only other complaint is that I found the names difficult. Eruz and his brothers, for instance, are Eruzasharbat, Hazramatanarg and Teshtarganazad, and all the rest of the family, army commanders and the like, have similar jaw-breakers. Fortunately they were often shortened. But that’s a minor point. I was given a copy of this book for honest review. 'Urdaisunia' is an epic fantasy novel about a peasant girl named Rashali, whose choice of a romantic partner is linked closely to her own destiny and the future of her people. My only complaint is the number of characters at the beginning, I found it difficult to remember them with all their unusual names, but as the story goes on it becomes easier, the main characters make themselves known and the heartfelt story begins. This was something differ I was given a copy of this book for honest review. 'Urdaisunia' is an epic fantasy novel about a peasant girl named Rashali, whose choice of a romantic partner is linked closely to her own destiny and the future of her people. This was something different for me, I usually tend towards more modern fantasy novels so I was pleasantly surprised by how much I enjoyed this. World building is essential in making an epic fantasy novel believable and this was very well done here. The story was also solid, emotional and intriguing. There were moments when I felt truly worried for Rashali and what might happen to her in the brutal world Halland has created. I wasn't sure what to make of Prince Eruz at first but his character grew on me by the end. Unique, Emotional & Engaging! A Refreshing Read! I Loved It! Rashali certainly wishes that. A widowed peasant woman, she has vowed to restore her people to greatness. Then she meets Prince Eruz, heir This review was first published on Kurt's Frontier. The writing flows well for the most part, with minor inconsistencies, sections which did not strike me as incorrect, but just perhaps a bit clunky. There are a LOT of invented words and five syllable names that I did find distracting from the plot. I also read this book aloud and I found myself tongue tied on the names. There is a huge amount of world building and much of it is laid out in the beginning of the book, which before building a strong investment in a specific story or character, and with tons of difficult names to weed through, it was hard to absorb all of that at once, but persevering did pay off. And all the back story does add to the reading experience. The book picks up steam though, and carries you through a great ride. I do recommend it to anyone who likes love stories with a fantasy or dystopian edge. The command of language is impressive and there are no visible typos. The story is very engaging, and I did not set the book down for longer than a day between reading sessions. I liked the tension that Halland crafted through shifting perspectives and unleashing little bits of story that hinted at coming drama. I really enjoyed the system that the author created for the deities in the story who turn the main characters into a high stakes wager. It made this action filled love story seem important on a grander scale. The ending is satisfying and I hope Halland keeps cranking out books. Urdaisunia is the tale of two main POV characters in a war torn and contentious land called Urdaisunia. Rashali is an Urdai woman who has fallen on hard times with the death of her family as a result of a plague. This loss and desperation frees her to take chances that most of her people wouldn't dream of, like standing up to the oppressive Sazar forces, who are better armed, better trained, and control all the water and wealth in the country. Rashali is a tragic character, but an exceedingly strong spirited one, who seems to land herself in dangerous situations with men who all have one thing in common: they desire her, but they don't truly value her. Except for one man, named Eruz, who happens to be the Sazar High Prince. He is the other point of vew character. Eruz is the heir to the Sazar empire, and yet he has compassion for the slave and peasant class Urdai people, upon whose backs the Sazar kingdom was built. He does everything he can to prevent his blood thirsty father and ambitious brothers from wiping out the Urdai, but as he does so, he weakens his position and his claim to the throne, which is something his father, the king, can remove from him with a single command and place it onto one of his two brothers who would surely put all the Urdai to the sword. He must fight for the throne, and he must fight for Rashali. Rashali is in denial about her feelings for the Sazar prince, and as she weaves her way through the underbelly of Urdai Rebel culture, people seem to sense her affiliation for Eruz like it is a mark she wears and can't wash away. This mark causes her to fight for what little scraps of trust she earns among her own people. All signs point to a coming war. The twist at the end is satisfying and powerful. I enjoyed this book. The setting in particular appealed to me (I pictured it as a fantasy version of the Middle East ~2k years ago, with a bit of ancient Greece--e.g., stories of gods and goddesses--thrown in). The dialogue was great, the writing strong, and the story moved fast. The story was very to-the-point (the protagonists quickly moved from place to place and emotion to emotion; as soon as the previous place/emotional state had made its contribution to the plot, the story moved on). This was good for what I was in the mood for: a quick, fun read. In Urdaisunia, a realm oppressed by cruel Sazar invaders, Urdai peasant Rashali longs for the day when her people will have the strength to rise up and reclaim their rightful place. But with a drought stealing the life of the land, such a future looks hopeless. Until Rashali has an unexpected confrontation with Eruz, the Sazar prince and heir, which catches the attention of the gods. The gods decide if Rashali and the Sazar prince marry, rain will again fall on the land. There is contention among In Urdaisunia, a realm oppressed by cruel Sazar invaders, Urdai peasant Rashali longs for the day when her people will have the strength to rise up and reclaim their rightful place. But with a drought stealing the life of the land, such a future looks hopeless. Until Rashali has an unexpected confrontation with Eruz, the Sazar prince and heir, which catches the attention of the gods. The gods decide if Rashali and the Sazar prince marry, rain will again fall on the land. There is contention among the gods, and while some wish for this to happen, others don't, which results in moments of divine intervention while Rashali goes on her quest to free her people and destroy the Sazar conquerors. The first chapters are a slew of names, races and places, none of which make much sense and makes it really hard going to start with. Past that, however, the exposition drops a lot and the characters get the chance to come through. It's a fairly straightforward Romeo and Juliet, with a conquering prince (and every other man and his uncle) falling for a conquered peasant woman, Rashali, with too much pride for her own good. There is an amusing framing device of a feuding family of gods overseeing The first chapters are a slew of names, races and places, none of which make much sense and makes it really hard going to start with. Past that, however, the exposition drops a lot and the characters get the chance to come through. A lovely adventurous plot. The story line flowed nicely as we near a war that few want, but seems inevitable with the usual greedy politics of the leaders. Thought all the men were a bit weak minded. Even the main male character. He wanted to achieve great things but didn't seem to push himself, unlike the female, she is one tough cookie. Not a great lover of stories with gods in. The gods always seem as daft as humans, yet they're supposed to be these great, all pow A lovely adventurous plot. The story line flowed nicely as we near a war that few want, but seems inevitable with the usual greedy politics of the leaders. Not a great lover of stories with gods in. The gods always seem as daft as humans, yet they're supposed to be these great, all powerful beings. Just the same in this tale really, they seemed to bicker and get themselves banned etc. I think this story could have been told just as well without their presence, but it might have been based on some mythology or other. A nice little romance develops, nothing too heavy . I enjoyed this. Fantasy story with star-crossed lovers - actually they are enemies at the beginning. His people conquered her land and virtually enslaved her people. The world's gods are active participants in this land, and they get their own chapters. Very interesting. The character names were very unusual and hard to follow for a while, but I finally caught on. Recommended to Becky by: The author. I loved it! The situation was compelling, the heroine was feisty and likeable, and the gods were amusingly naughty. Oh, and the forbidden love interest was hawt! Lots of action and suspense kept me wanting more. A romantic, colorful fantasy tale. This story is full of rich history, mythology, and the best and worst of human nature. You really shouldn't miss out on this amazing adventure! Kyra Halland lives in southern Arizona Kyra Halland has always loved fantasy. She has also always loved a good love story. She combines those two loves by writing the kinds of romantic fantasy novels she loves to read, tales of magical worlds where complicated, honorable heroes and strong, smart, feminine heroines work together to save their world - or their own small corner of it - and each other.